A good steady demand returned for a seasonal entry of cattle at Lisnaskea Livestock Sales on Tuesday, April 9. This week cows and calves sold to £1,240 for a cow with heifer calf. Store bullocks sold to £1,175 for a 530kg Charolais (£221) with others selling from £174 to £202 per 100kg. Store heifers sold to £1,035 for a 440kg Limousin (£235) with others selling from £184 to £213 per 100kg. Weanling males sold to £1,005 for a 440kg Charolais (£228) and £1,000 for a 400kg Charolais (£250) with smaller ones selling to £765 for 280kg (£273). STORE BULLOCKS: Lisnaskea producer Charolais to £1,175 for a 530kg Charolais (£221) and 430kg Charolais to £710. Fintona producer 620kg Charolais to £1,145, 630kg Charolais to £1,100, 590kg Charolais to £1,060, 580kg Charolais to £1,050, 540kg Charolais to £1,035, 510kg Charolais to £935, and 500kg Charolais to £900. Maguiresbridge producer 480kg Aberdeen Angus to £970, 480kg Hereford to £945, 450kg Limousin to £900, and 450kg Aberdeen Angus to £830. Innishmore producer 440kg Aberdeen Angus to £885. Maguiresbridge producer 460kg Limousin to £885. STORE HEIFERS: Newtownbutler producer 440kg Limousin to £1,035 for a 440kg Limousin (£235), Derrylin producer 370kg Aberdeen Angus to £790 and 400kg Aberdeen Angus to £780. Derrylin producer 370kg Limousin to £730 and 380kg Hereford to £700. COWS & CALVES: Derrylin producer £1,240 for cow with heifer calf. WEANLING STEERS & BULLS: Newtownbutler producer 440kg Charolais to £1,005 for a 440kg Charolais (£228) and a 400kg Charolais to £1,000 (£250) and 330kg Charolais to £670.Newtownbutler producer 450kg Limousin to £900, 370kg Limousin to £860, 400kg Limousin to £850 and 390kg Limousin to £810. Lisnaskea producer 370kg Charolais to £870, 350kg Charolais to £845, 400kg Charolais to £820, 360kg Charolais to £810 x 2 and 290kg Charolais to £740. Newtownbutler producer 370kg Charolais to £860, 360kg Charolais to £850, and 430kg Charolais to £800. Rosslea producer 360kg Charolais to £840, 280kg Charolais to £705, and 330kg Charolais to £700. 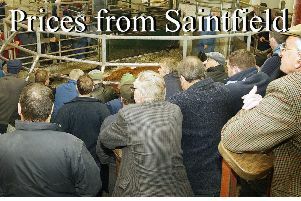 Maguiresbridge producer 330kg Limousin to £810 and 310kg Limousin to £810. Newtownbutler producer 370kg Limousin to £805 and 330kg Limousin to £760. Lisnaskea producer 340kg Limousin to £800. Lisnaskea producer 330kg Simmental to £800 and 370kg Simmental to £785. Kinawley producer 280kg Charolais to £765 (£273) Fivemiletown producer 300kg Charolais to £720, 270kg Charolais to £635 and 280kg Charolais to £540. Lisnaskea producer 270kg Simmental to £650. Lisnaskea producer 300kg Aberdeen Angus to £630. WEANLING HEIFERS: Derrylin producer 360kg Limousin to £820 (£228) and 330kg Limousin to £760 (£230), Kinawley producer 340kg Charolais to £800 (£235) and 310kg Limousin to £795 (£256), Lisnaskea producer 380kg Limousin to £795. Newtownbutler producer 380kg Limousin to £780, 330kg Limousin to £700 and 310kg Limousin to £675. Lisnaskea producer 340kg Charolais to £755. Rosslea producer 290kg Charolais to £740, 370kg Charolais to £705, 380kg Charolais to £700, 260kg Charolais to £650, 300kg Charolais to £620 and 370kg Charolais to £595. Maguiresbridge producer 330kg Limousin to £620. Brookeborough producer 280kg Charolais to £615. Lots more stock required to supply a growing demand from a full attendance of buyers each week.